Over the past 50 years, INGENIUM has built up enormous expertise in the hospital sector. In recent years, however, we have noticed that quite a few internal technical departments are finding it hard to cope with the growing complexity of the installations. 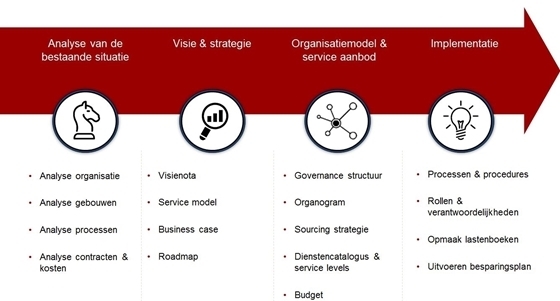 Our new multi-step plan - which we immediately applied at the hospitals AZ Sint-Blasius (Dendermonde) and AZ Alma (Eeklo) - shows that this integrated approach pays off. The first step - inventory - was only applied at AZ Sint-Blasius. After all, an established hospital has undergone more metamorphoses than the brand-new AZ Alma. That is why it was important to get the installations and all their components completely overhauled in Dendermonde first. The second step is a condition assessment. What is the current state of the installations? What works as it should, what doesn't work sufficiently, or at all, and which elements need to be followed up? The data from the condition assessment are subsequently processed in a multi-year budget plan which indicates exactly which investments must be planned and budgeted when. In a fourth step, a maintenance schedule is drawn up for the installations that prove to work well during the condition assessment. Which maintenance is strictly necessary and which is desirable? Of course, the requirements of the manufacturers of the installations are also taken into account. The fifth step is about dividing the tasks. Together with the hospital manager, we look at who will take on which tasks. What can the hospital's technical department take on and are the necessary competencies available or does additional training need to be provided? Which tasks are better outsourced, especially for very complex assignments? In this way, the various roles and responsibilities are defined. In a sixth step, an initial basic estimate is drawn up for the tasks that are outsourced. This also includes the conditions imposed by the hospital itself. As this creates uniformity, the follow-up of the various sub-areas will be more efficient. After all, the seventh and final step is to invite tenders for each subarea, linked to the basic specifications. The contracts can then be awarded to the right contractors via a tender. Will such a long-term plan soon obviate the need for the internal technical department within a hospital? Not at all! A new hospital such as AZ Alma has also opted to develop its own technical department. Since continuity in a hospital is extremely important both in terms of level of comfort and processes, they provide round-the-clock availability and make urgent interventions. In this way, the hospital manager is in control of the contact with the internal client (patients, doctors and care providers).